So, what did I learn after a week on and off the coast of Maine? That pretty much everything is hard to draw if you've never, except in 8th grade art class, drawn anything. The big brown rocks at the edge of the ocean beneath Jamie Wyeth's house at Monhegan Island's Lobster Cove. Impossible to make look like anything except random pencil squiggles. The cluster-of-rooftops-overlooking-the harbor. Turned out fairly well -- according to the teacher. Maybe she was just being nice, since I was the newbie in the group. The sweet white wooden punt boat that was pulled up onto the Swim Beach, near the ferry dock. Had wicked gentle curves that, on paper, got erased with my malleable grey eraser ball way more than they got sketched. But, after a couple of hours I'd entered the spirit of the long-dead islander who'd made the boat, following his eye as he traced the angle of his design in his mind. Which was kind of the point, no matter what my drawing looked like. 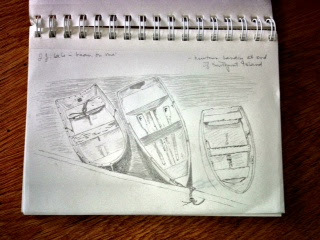 By the end of the week, my last sketch, of three little dingies at Newtown Landing at the end of Southport Island in Boothbay Harbor, actually looked like three little dingies. If you think drawing these is no big deal, you've never tried it. Words come comparatively easily to me, maybe because I read my brains out from the age of 10. Making images is, for me, way harder. Writing v. Drawing: Two different kinds of abstractions that try to mimic reality. Sitting outside for hours, in an unseasonably chilly and damp June week, on a tiny island off the eastern edge of North America. Obsessing on every detail of what was right in front of me. 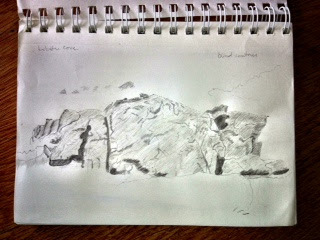 Trying to replicate it on a sheet in my Windpower sketch pad, with a No. 2B Staedtler Mars Lumograph pencil. Erasing. Looking harder. Getting the curve. Erasing. Getting the angle better. Like editing words, only different. My Maine mission was accomplished. I'd walked into the object and stayed there until I got the picture. 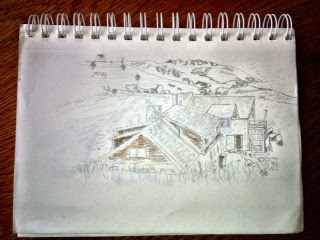 Next step: always take a sketch pad along so you can write and draw what you see. 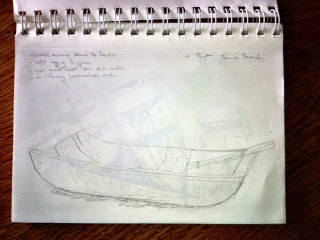 * J. J. Cale's "Lean on Me" was playing on a CD player in the little local Boothbay ice cream place the day I drew this. The flavors were so good, I went twice in one day (Cowboy Junkies "Misguided Angel" was playing the second time). Two-scoop bliss.